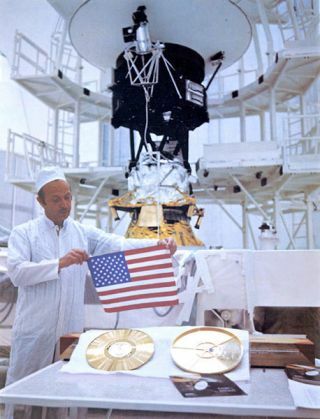 John Casani, Voyager project manager in 1977, shows of a small Dacron flag that was folded and sewed into the thermal blankets of the Voyager spacecraft before they launched 33 years ago. Voyager 2 stands behind him before heading to the launch pad in August 1977. Full Story. This July 4th, U.S. citizens around the world may proudlydisplay American flags to celebrate Independence Day while away from home, butthey won't hold a candle to the farthest American flag in history, which isleaving the entire solar system behind on NASA's Voyager 1 spacecraft. The spaceflying American flag is a not a huge version ofOld Glory, but will be the only one flying more than 10.5 billion miles (16.9 billion km) from Earth this Fourthof July. It is riding on Voyager 1, a 33-year-old space probe on theoutskirts of our solar system. Another far-flung American flag is flying on Voyager 2,which is about 8.6 billion miles (13.8 billion km) fromEarth. Both Voyager 1 and Voyager 2 are on trajectories to leave the solarsystem behind after passing through a magnetic bubble-like region called theheliosphere. A? NASA photo of the Voyager 2 American flag showsit to be a small U.S. standard packed alongside other mementos from Earth, likethe iconic golden record that were also launched the spacecraft and containmessages from Earth for any extraterrestrials that may find them. ?We were extraordinarily proud of what we were doing as alaboratory, as a part of NASA and as a country and we felt it was important tomake a statement to that effect,? said Jet Propulsion laboratory scientist JohnCasani, NASA's Voyager project manager at the time it was launched, in astatement provided to SPACE.com this week. ?I?m gratified that Voyager is stillsailing out there, bearing America?s colors. What it represents to us is anaffirmation of the pride we had at that time." The American flags riding the Voyager probes are not theonly distant U.S. standards out in space. Flags were planted on the moon byAmerican astronauts during the six Apollo lunar landings in the late 1960s andearly 1970s. NASA probes to Mars and elsewhere also include the U.S. standard. But the two Voyagerprobes are currently the farthest human-built objects fromEarth, making their American flags the most distance from U.S soil. The probes'signals take nearly 13 hours to travel to NASA's worldwide Deep Space Networkof listening antennas and back. NASA launched both spacecraft in the summer of 1977, butonly Voyager 2 took a so-called "grand tour" of the solarsystem when it visited the gas giant planets Jupiter, Saturn,Uranus and Neptune in the 1980s by taking advantage of a rare planetaryalignment that occurs once every 176 years. Voyager 1 flew past Jupiter andSaturn. On June 28, Voyager 2 hit a major milestone when itmarked the 12,000th day of its mission. Voyager one, which launched later than itscounterpart, will hit the same milestone on July 13. ?I?m proud of the people who worked on this and put somuch of their life and energy into building, developing and flying that thing,"Casani said. "They did it right.? Is the Apollo 11 Moon Landing Flag Still Standing?